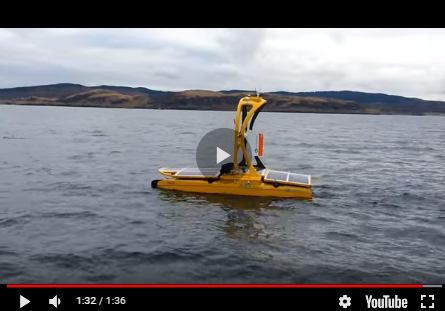 In what is believed to be a world’s first in the scientific community, Cefas (Centre for Environment, Fisheries and Aquaculture Science, UK) and Liquid Robotics, USA, have successfully deployed, tested and recovered a remotely piloted Wave Glider. This allowed scientists to measure water characteristics and selectively collect samples in near real time. The Wave Glider called Lyra was deployed in the southern North Sea about 60km off Lincolnshire, UK coastline by RV Cefas Endeavour and spent 48 days at sea before being recovered successfully by Trinity House’s vessel Alert, 20 miles off Lowestoft. Whilst deployed, the Wave Glider was remotely piloted 24/7 by the Liquid Robotics Operations Team from their California headquarters almost 9,000km away and covered over 2,700km at sea. Sampling helps scientists assess the health of our oceans. Harmful algal blooms can lead to fish mortality events and cause toxicity in shellfish species which, if consumed, can be dangerous to human health. Using experimental daily satellite images of a harmful algal bloom (courtesy of NEODAAS, Plymouth Marine Laboratory), Cefas scientists navigated Lyra to a small suspected bloom of Karenia sp. north of the Dogger Bank. Once in the area of the bloom, scientists monitored the near-real time data from the on-board chlorophyll sensor to confirm its presence. They then commanded the water sampler on Lyra to take two samples that have since been confirmed to contain the phytoplankton Karenia sp. This first test of the remote triggering of the Cefas Water Sampler has been a success. The area in which the Wave Glider operated successfully was extremely challenging for an autonomous surface vehicle. During the trip, Lyra picked up transmission of over 350 ships, was closely inspected by two oil/gas industry standby vessels and navigated through many of the southern North Sea gas fields/platforms. Lyra also had to navigate around many shallow sandbanks in the southern North Sea and cope with strong tidal currents off East Anglia on her way back to Lowestoft. Dr. David Pearce, Cefas Marine Observations Systems manager and in command of this mission said the ability to collect samples on demand enables Cefas to better target areas of scientific interest, potentially allowing the organisation to collect specific samples more efficiently. He sees potential in smart solutions for monitoring ocean conditions and is excited about the future for autonomous vehicles, such as the Wave Glider, as innovative ways to meet our scientific and monitoring goals. Unmanned surface vehicle and mission tests like this allow Liquid Robotics to work with scientists to provide data for near real-time decision making, added Daniel J. Middleton, executive vice president of Global Sales and Business Development, Liquid Robotics. Their Operations team remotely piloted the Wave Glider around obstacles and in strong currents to areas of scientific interest. Cefas scientists are now planning to use the Cefas Water Sampler on additional upcoming Lyra missions. The sampler will be used to pump out ‘tracer’ material. When combined with the on-board sensors, this extends the research applications of this innovative technology to, for example, mapping localised areas of sea surface. Lyra expands Cefas’ research and monitoring capabilities in areas such as water quality monitoring, fisheries assessments, aquaculture health and ambient noise measurement.